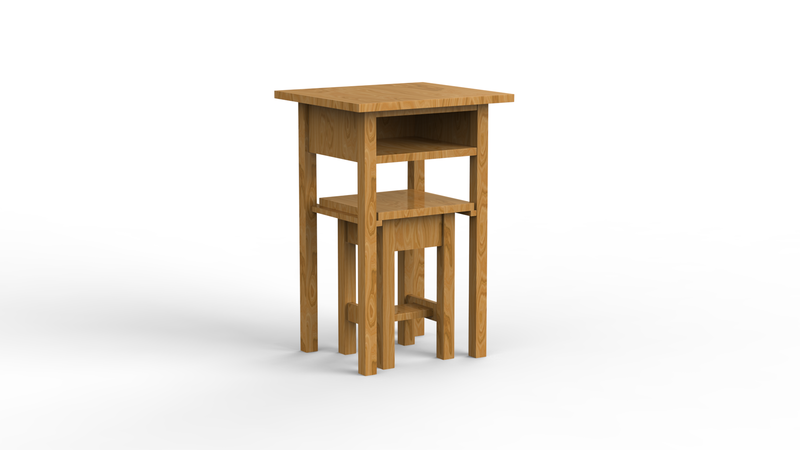 Build a mission style telephone stand and stool or small nesting tables with free plans. 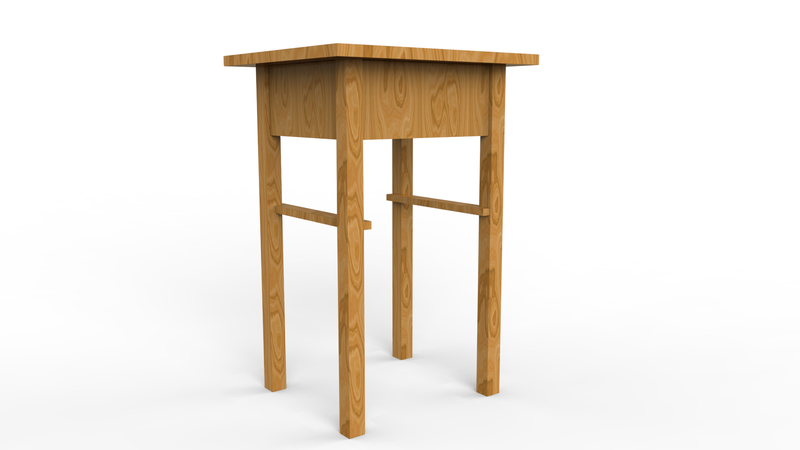 Click here for detailed nesting table plans. The stand shown is for use with a desk telephone or could be used as 2 small nesting tables. The stool when not in use, slides on two runners under the stand. A shelf is provided for the telephone directory, paper, pencil, etc. 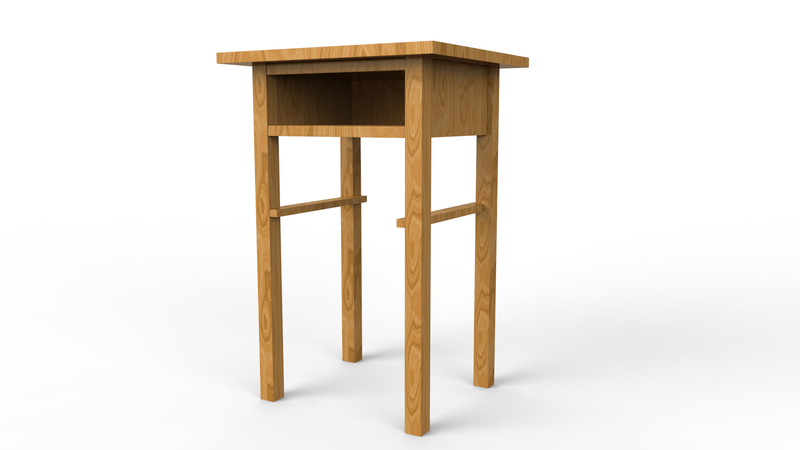 The joints may be made with dowels, or the mortise and tenon may be used, as desired. If the latter is decided upon, allowance must be made on the length of the rails for the tenons. The list given is for the dowel-made joints. 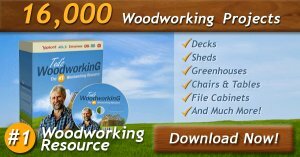 The following stock list gives the amount of material needed which should be ordered planed and sanded. This work can be done by hand if the builder has the time and desires to have an entire home-made article. However, the list is given for the mill-planed material. 4 posts, 1-1/2 in. square by 29 in. 2 rails, 7/8 by 5 by 11 in. 1 rail, 7/8 by 1-1/2 by 13 in. 1 rail, 7/8 by 5 by 13 in. 2 runners, 7/8 by 1-1/2 by 14 in. 1 top, 7/8 by 18 by 20 in. 1 shelf, 7/8 by 12-7/8 by 13-3/4 in. 4 posts, 1-1/2 in. square by 17 in. 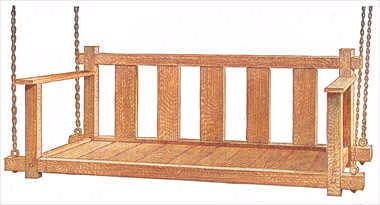 4 rails, 7/8 by 4 by 6-1/2 in. 4 rails, 7/8 by 2 by 6-1/2 in. 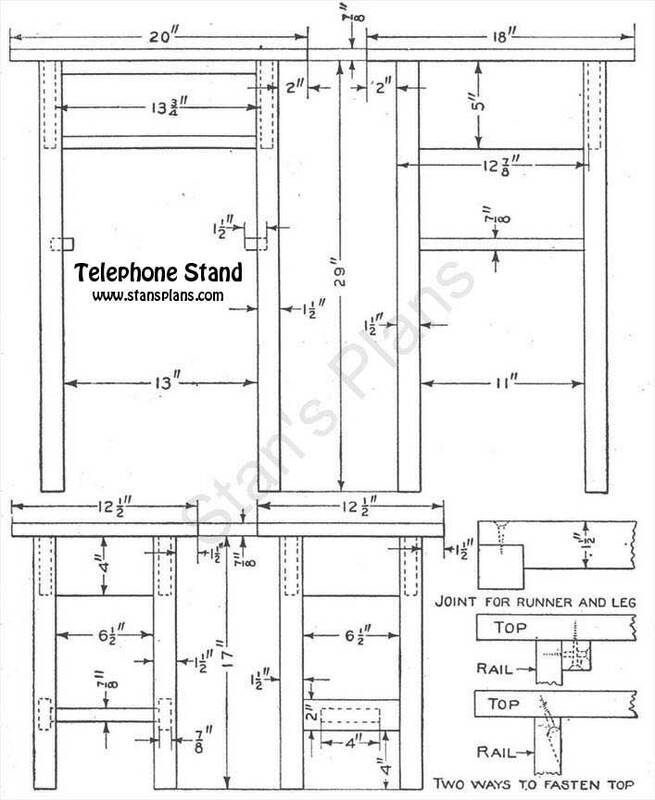 1 stretcher, 7/8 by 4 by 7-1/4 in. 1 top, 7/8 by 12-1/2 in. square. The exact lengths for the posts are given in the list. Should you desire to square them up, allowance must be made for this when ordering stock. Arrange all the pieces in the position they are to occupy in the finished stand and stool and number all the joints. Locate the centers and bore holes for all the dowels. Assemble the two sides of the table first. Notch the runners and fasten them to the posts with flat-head screws. Use hot glue on the dowel joints if possible. Cut the corners out of the shelf to fit the legs and assemble the frame of the table. Use round-head screws through the rails to hold the shelf. The top may be fastened in two ways, with screws through cleats on the inside of the rails and under the top, or with screws slanting through the upper part of the rails and into the top as shown. 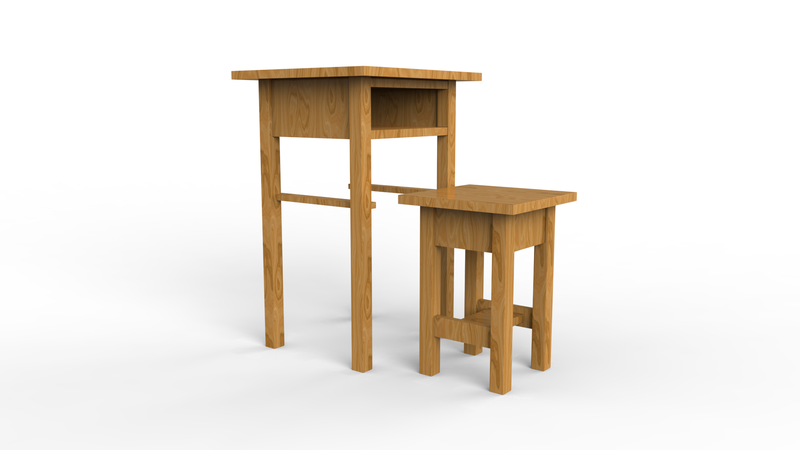 The stool, is assembled in the same manner as the stand. 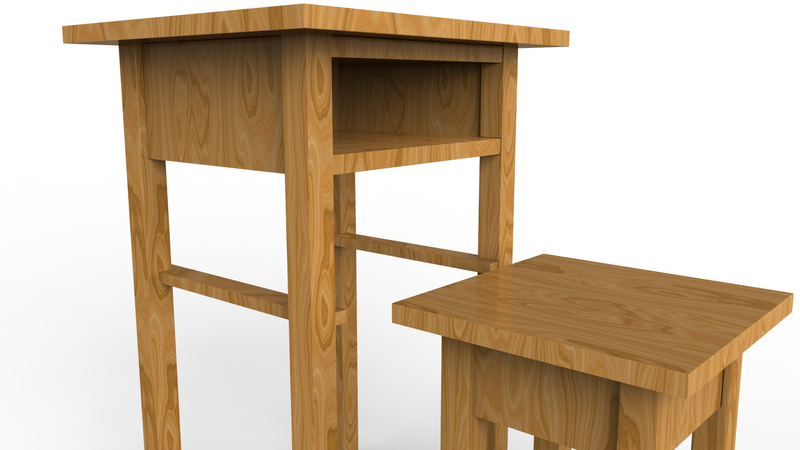 The stand and stool should be finished to harmonize with the furniture and woodwork of the room in which they are to be used.